How hard is it to make this modification? 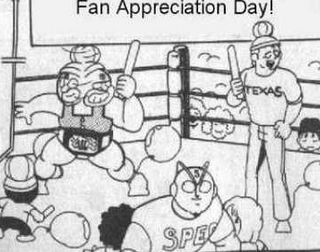 I noticed that it looks like a Kinnikuman torso section is that accurate? 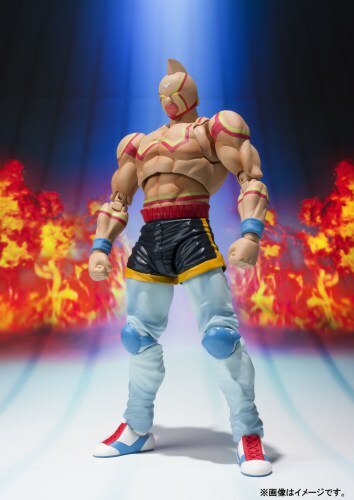 ..must have new KiNNiKuMaN Muscle Shot update for Andriod..
Really want to see how the S H Figuarts version will stack up next to it. How big are the revoltech figures? How do they compare to Figuarts? 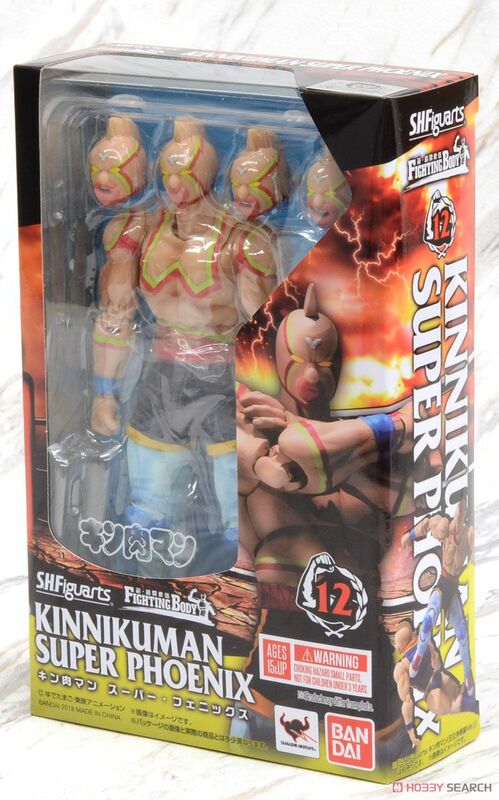 The old Kinnikuman, #128, not sure but probably a bit smaller than the Figuarts. Everything else is part of the Revoltech Micro line and are around 4" tall. Here is my collection of Kinnikuman Super Poseable figures: From Top Left to Right---Ultimate Muscle Version, SH Figuarts Version, Revoltech Yamaguchi, Mini Revoltech Yamaguchi. 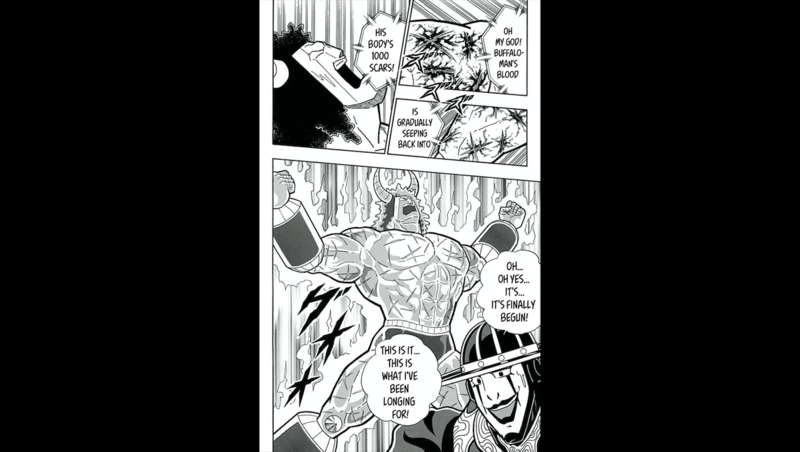 Bottom Left and Right---Takara Microman and Romando Glorious Muscles. Those sizes are more different than I would have expected. Do you have a personal preference when it comes to either size or posability? I've only been buying the Figuarts figures, but the Revoltech figures seem to be of similar quality. 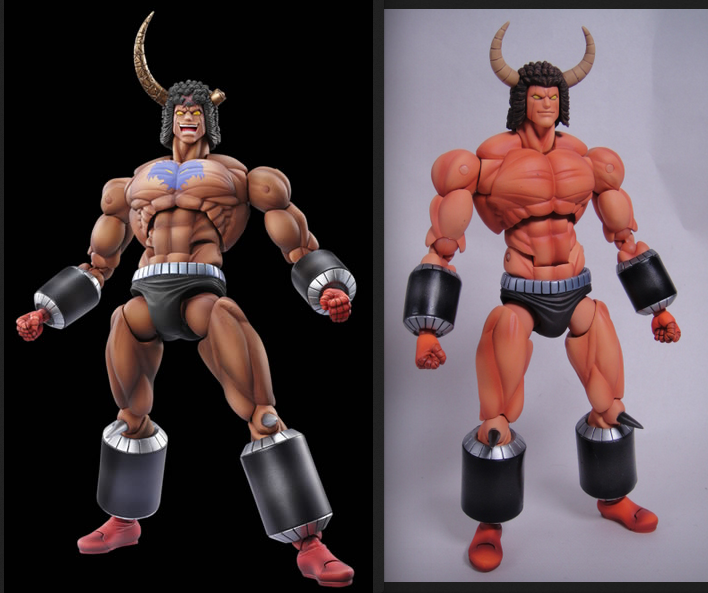 I would say that out of personal preference with the current figures, I do prefer the SH Figuarts Kinnikuman line. I have bought all of them except the repaints. 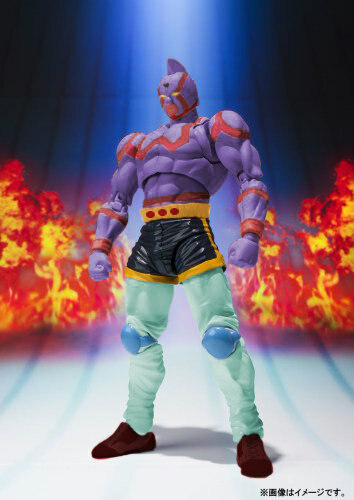 (I kind of see them as redundant figures unless it's unique like the shirtless Brocken Jr. or the Scramble Outfit Suguru) My only gripe with the Figuarts is that they are missing a bicep swivel joint. This of course has been rectified through a swivel elbow joint, but looks kind of weird. Still I like them overall. I particularly liked the Microman version for a long time because of it's compact size and articulation count on such a small figure. However, proportionally it wasn't the best looking overall. Most of my current collection has super articulation. I don't really subscribe to having statues for figures. 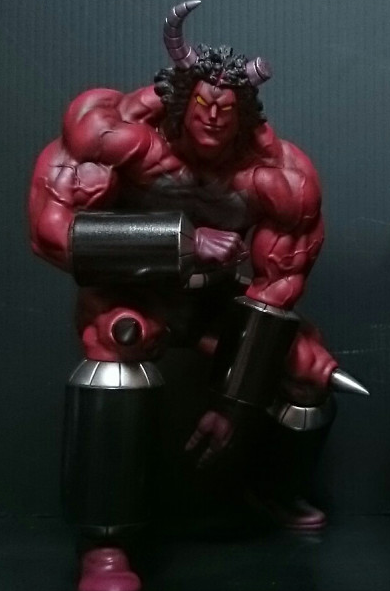 The sculpting is usually pretty awesome on statuesque figures but I like to play with and pose my toys when I get bored. That's me. 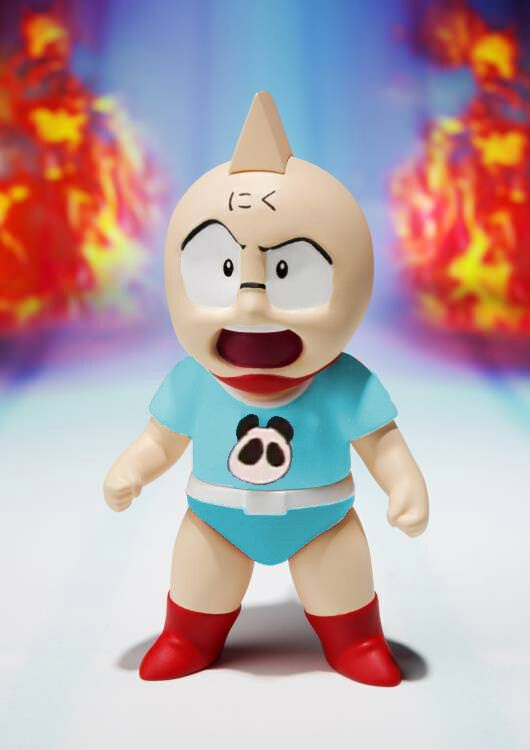 I am currently working towards making my own toy line with super articulated figures and would love to tackle the Kinnikuman license. We'll see someday if that comes true. Edited by darkhadou316, 25 January 2018 - 01:21 AM. Oh nice!! Finally some news!! 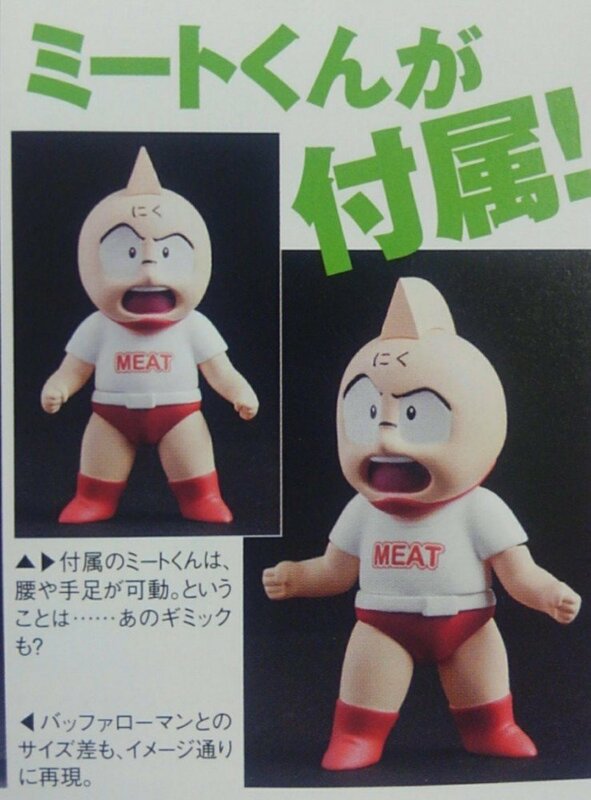 I'm guessing that meat figure is an extra included in the Buffalo re-paint?? With Super Phoenix out next month and now news I was getting worried. I guess this will be our September release?! Nope, check the info box: July! Yeah, far as I’ve seen Meat is Buffaloman’s accessory. I like the repaint, is it up for pre-order? Nope, too soon. More likely Thursday or Monday for Japanese preorders, Western ones will take longer. Yup! You beat me to linking to it. I’m not rushing to preorder yet but I do need Meat, OBVIOUSLY, so a later purchase is likely. This a repaint that I can get behind! According to one of the sellers on ebay for Super Phoenix, the scheduled date of release for him is March 24th in Japan which means that you can order him from one of the sellers and get it shortly after that! Awesome! Super Phoenix now out in Japan! Looking good!! I can't wait to get mine! Edited by Kanji, 22 March 2018 - 08:22 AM. 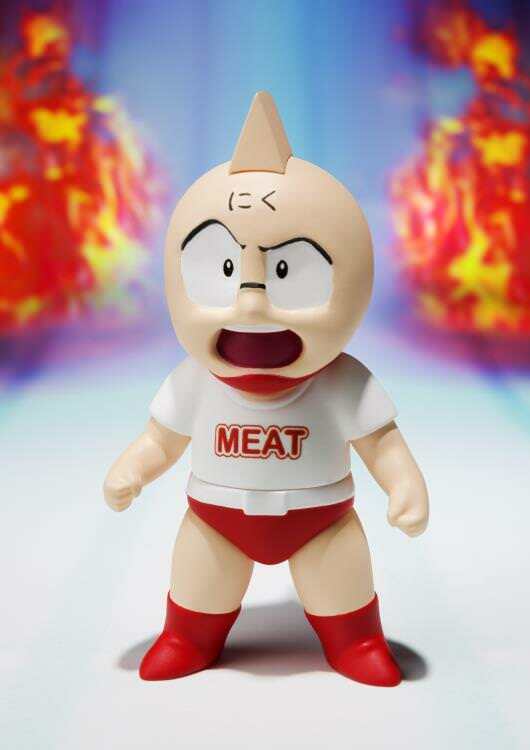 Can anyone tell me which arc the Meat with MEAT on his outfit is from? I know i've seen it before in some medium, but having rewatched the anime recently, I can't seem to find it!! 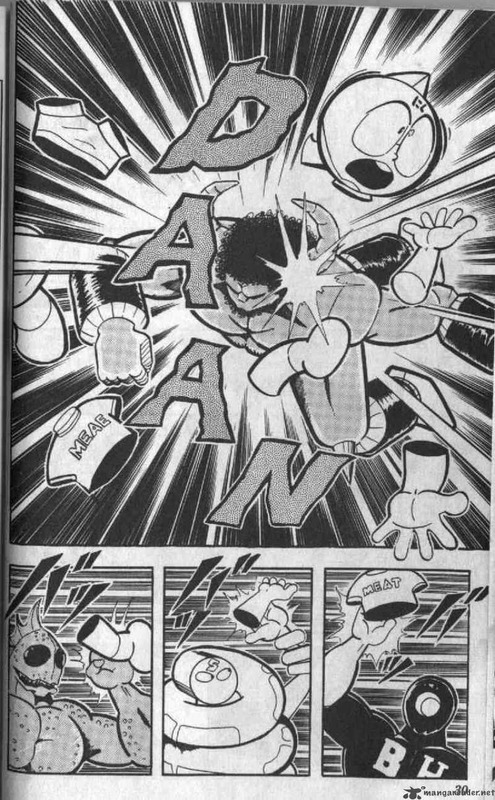 Meat may wear it at other times throughout the series in various mediums, I'm not sure, but the instance that I do know of is from the Seven Akuma Choujin Arc. Interestingly, it says "MEAE" when he's blasted apart, and then "MEAT" once Black Hole grabs the torso. Not sure if that was Yudetamago making a joke or an error. 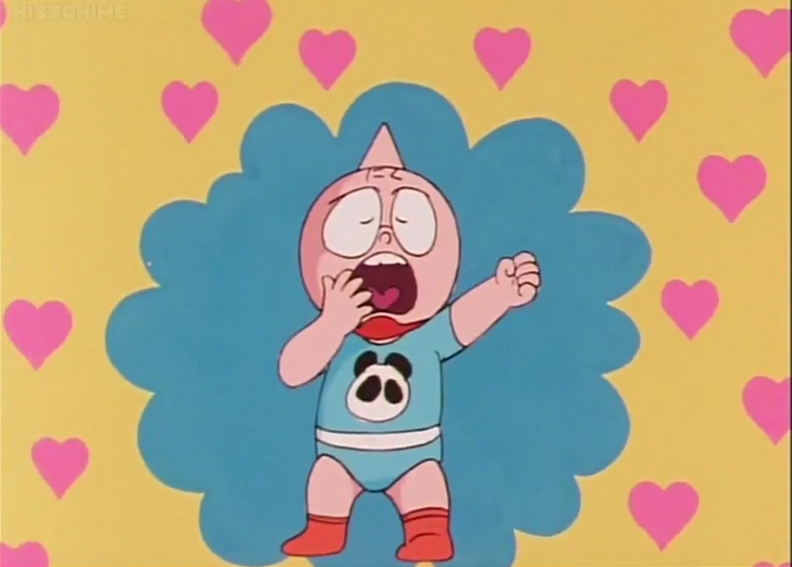 It appears that the Anime team, either to avoid such issues and/or to ease the animation process, opted for the panda shirt instead. Also, notice how the above "MEAT" is done in white letters. By the time in the series that he's revived, the letters are now drawn as filled in with a thin boarder around the word. This design matches the SH Figuarts exactly. My guess is that the swivel joints on Meat will allow the figure to pull apart into 7 pieces. Bandai not advertising that feature either means that the figure doesn't pull apart, or Bandai is strategically holding off until they can do something like a promo with that teased Black Hole figure from way back. We do know he has swivel arms and hips, and he appears to be coming apart at the arm in the above-right pic. Now the true mystery. 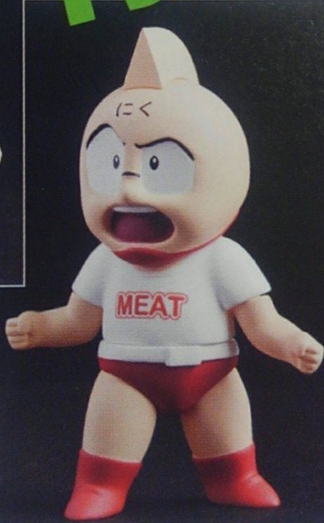 I looked into seeing how consistent the way "MEAT" was drawn onto his shirt, and I found something interesting. 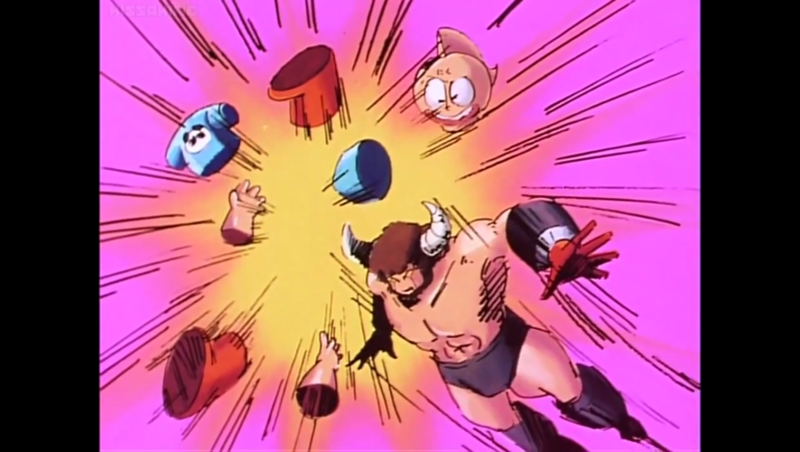 "MEAT" is solid when Meat is in one piece, then white once he's broken apart, and becomes solid again once the arm is attached. You can see how his shirt differs from one page to the next in these two instances of being separated and brought together. 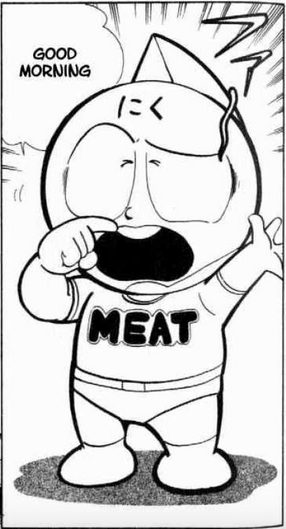 Does Meat's shirt indicate his life force? Or is it just an inconsistency, like Terryman's TEXAS shirt? Edited by toyhandle, 04 April 2018 - 02:31 PM. Thanks toyhandle for the extensive answer!! Much appreciated!! I must remember seeing it in the manga, but no wonder I didn't come across it in the anime!! Regardless, I am really looking forward to this release. I received my Super Phoenix today and spent an hour setting him up to perform the muscle inferno!! Ran out of time to take photo's! will post some in the morning!! Edited by Kanji, 05 April 2018 - 11:28 AM. Edited by Kanji, 06 April 2018 - 03:42 AM. Nice poses! 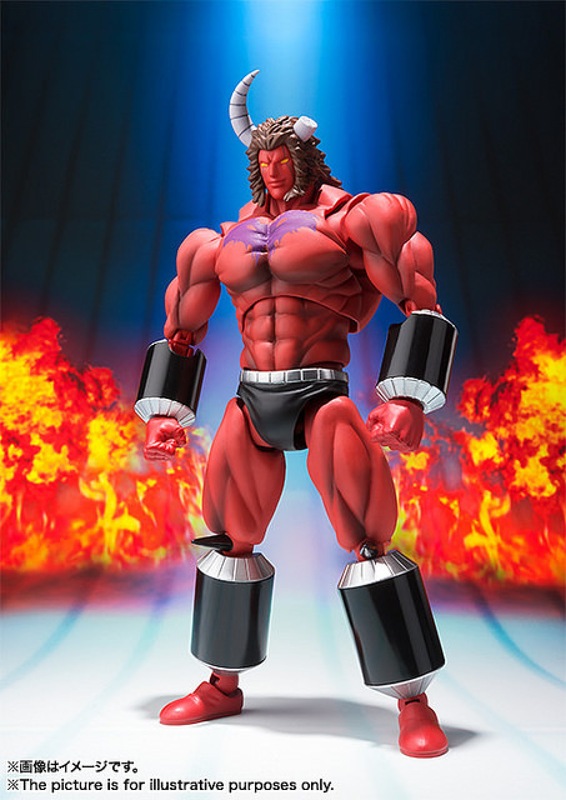 I especially like Akuma Shogun vs. The Man. What made you go for the Muscle Inferno? I love that move. 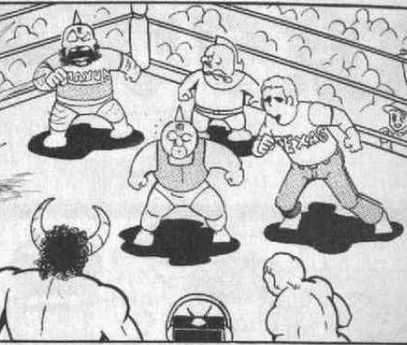 It cracks me up, being somewhat out of place in terms of wrestling moves, even for Kinnikuman. Really hoping we get Zebra soon. Are you planning on seating anyone in those fold-chairs? Otherwise, I think it'd look better without them and free up space. Also, been a while since I did some recolors. 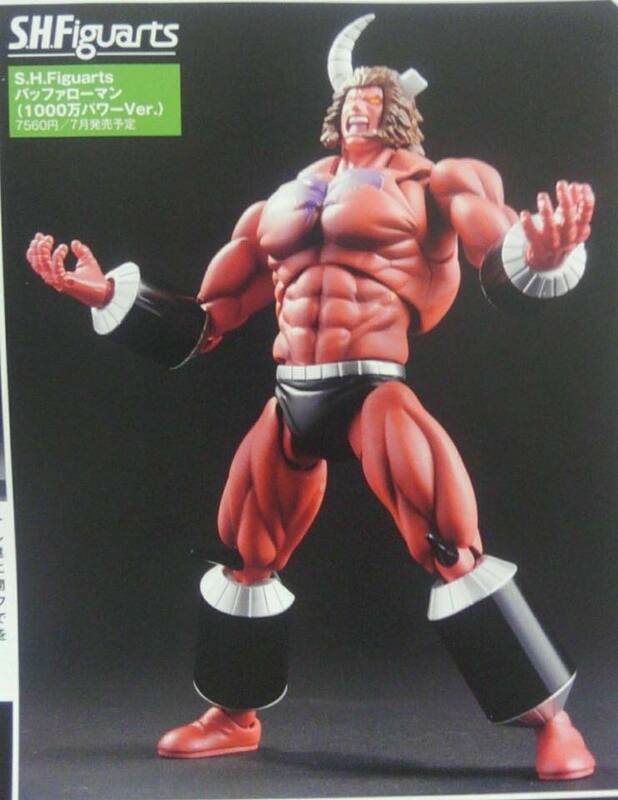 Kinnikuman Super Phoenix - Choujin Enma Vers. That 10 Million Power designation is misleading. 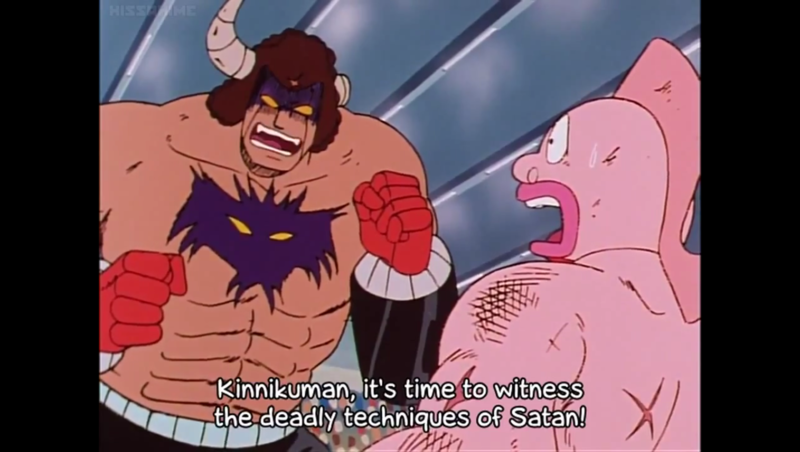 I wonder if it has something to do with avoiding a name like "Satan Possessed Buffaloman." I'm working on a post about it. Edited by toyhandle, 10 April 2018 - 09:10 AM. 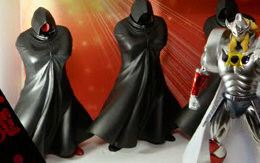 Medicos also made two seperate SAS figures of the looks. 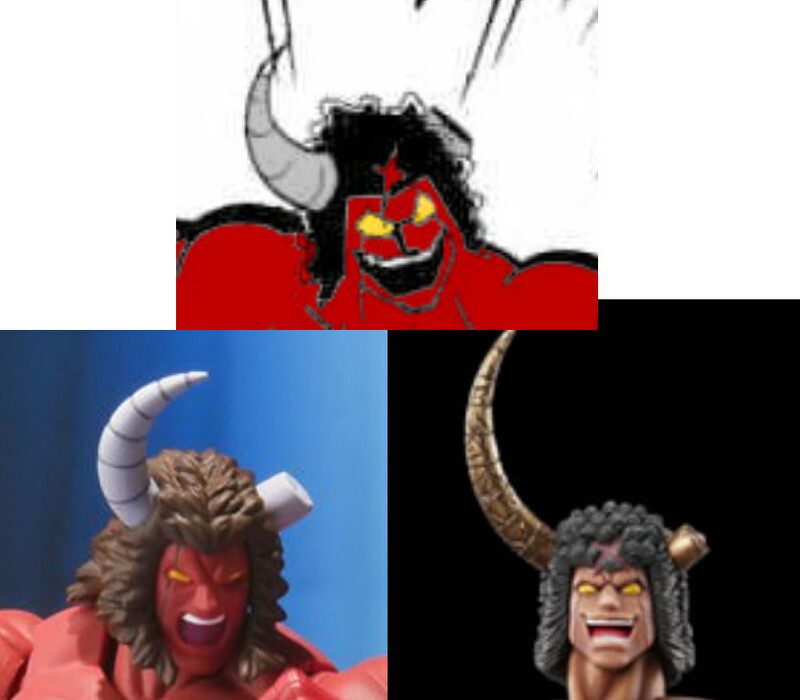 Because Buffaloman never had red skin along with the Satan symbol in the anime, that means the SH figure is the OCE version. So, I looked all over for examples of this color combination. The scars gather to his chest, and form the symbol. No mention of how his skin looks, or indicator in the art. 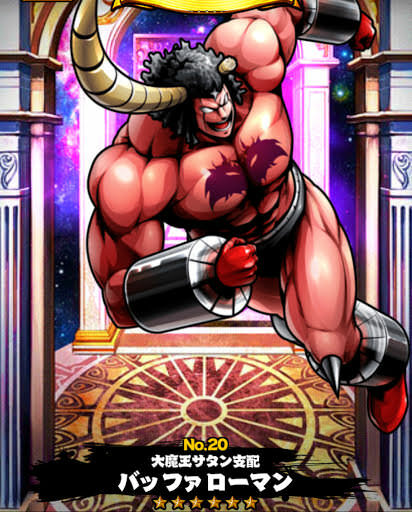 "Buffaloman becomes bright red! 10 Million full power!" 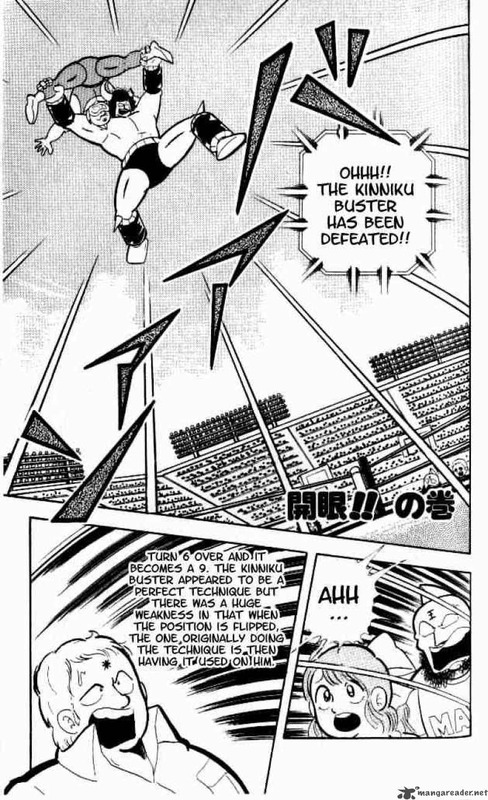 He overpowers and reverses the Kinnikubuster, and the chapter 151 ends. Chapter 152 begins and the mystery is solved. 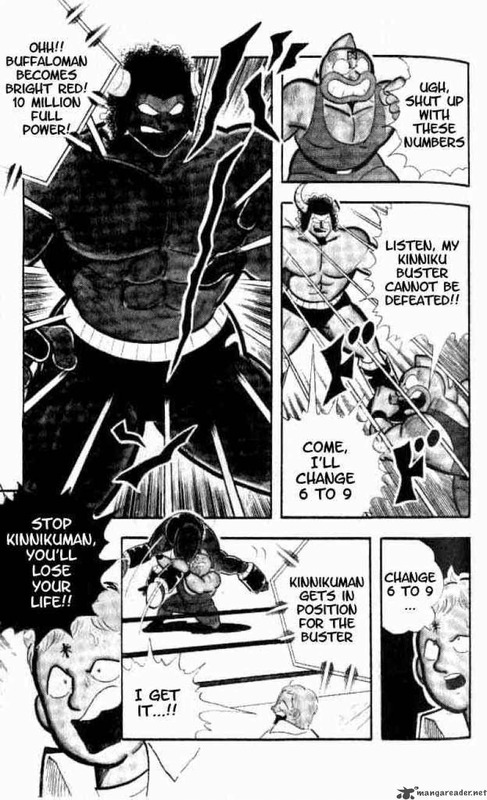 In another case of Kinniku-inconsistency, by choosing to no longer draw Buffaloman with dark skin despite being at 10 million power, it establishes that Buffaloman may be at 10 Million power at any time, and the manga does not need to state it, or indicate it in the art. 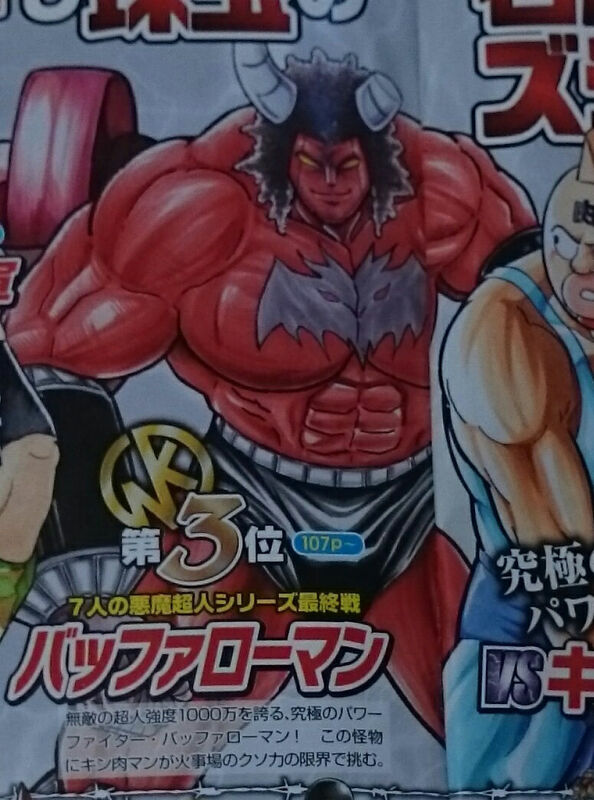 So, now that we know this, when does he become red again in the Manga? Does he ever stop being at 10 million power after reaching it in the first place? Buffaloman does a classic skin-shattering reveal, and presents his scarred body. The symbol forms and his eyes shade purple. Because the symbol requires the scars, and the scars come after his skin was shed, I was reminded of the Revival series' Grim Reaper vs Buffaloman fight, in which Buffaloman had his skin ripped off, and we saw his scarred body beneath. 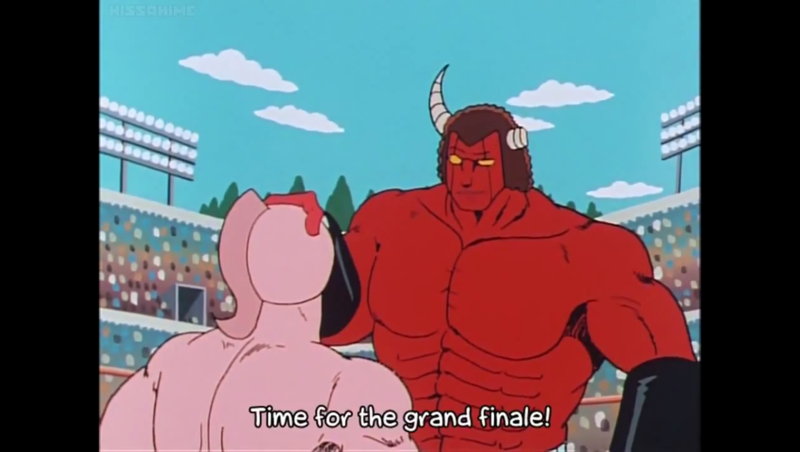 I found this colorized image of the scene from the Kinnikuman wikia. 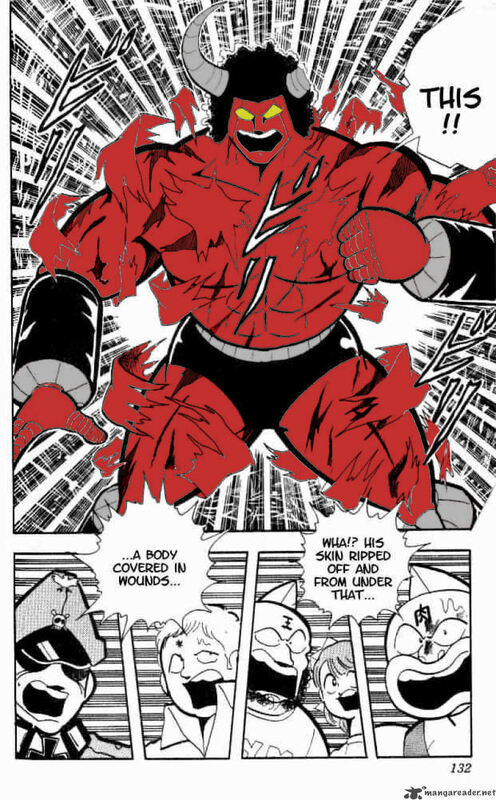 So is Buffaloman's true scarred-skin color red in the Manga? 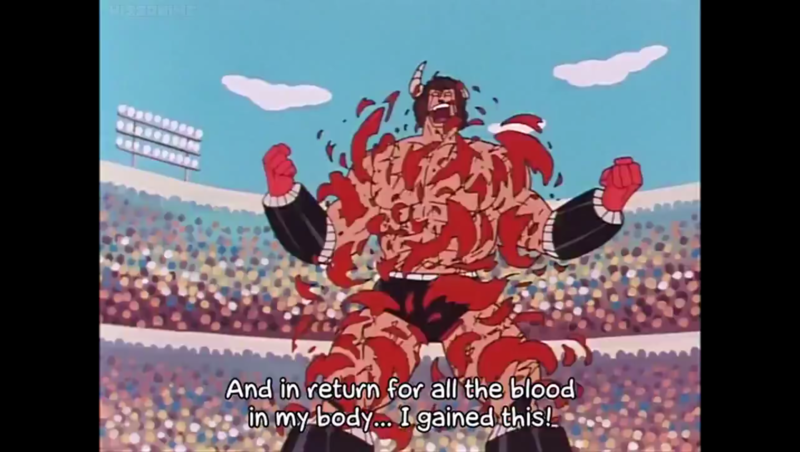 Buffaloman may have been red with blood in the revival arc, but that blood is absorbed back into his body, and Vol. 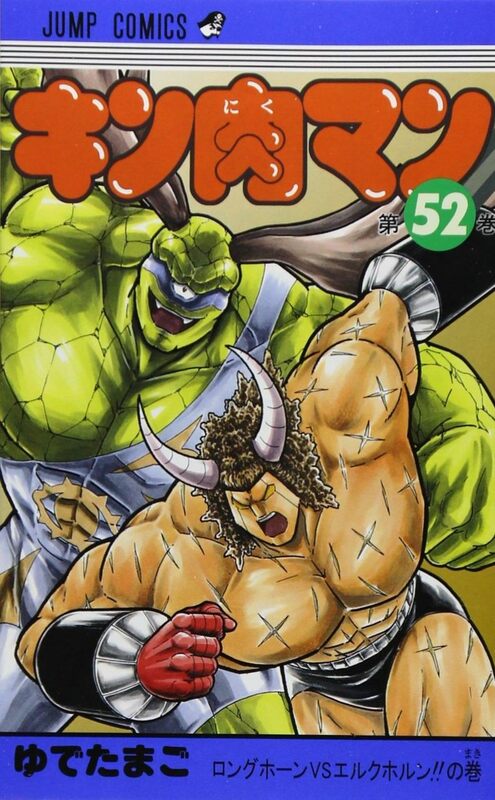 52's cover shows his true scarred-flesh tone. 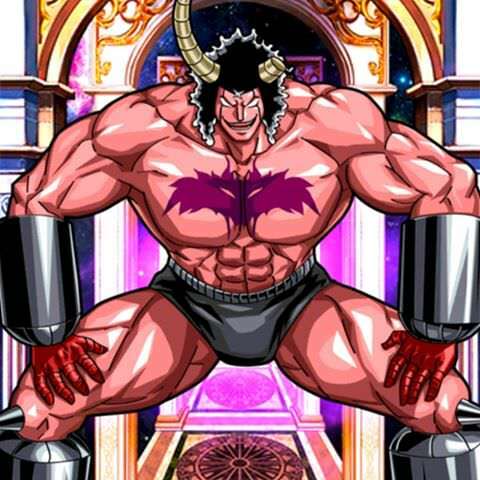 Instead of getting purple-shadowed eyes as done in the Anime, Satan takes over Buffaloman's body and goes straight back up to 10 Million power in the Manga. It makes even more sense. 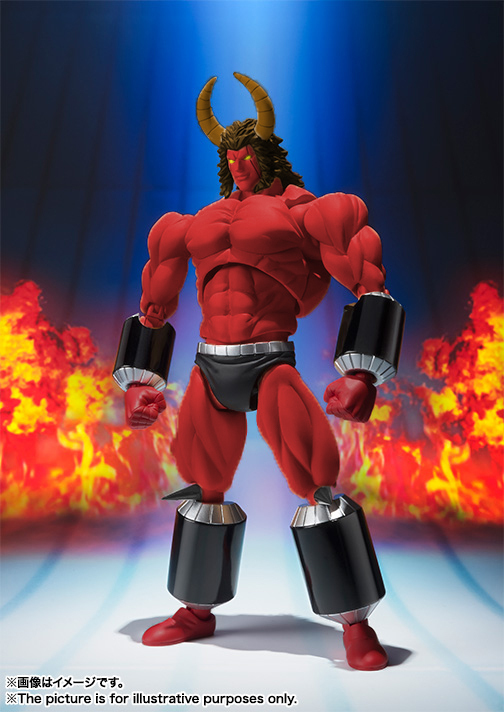 Why wouldn't a Satan-Possessed Buffaloman be red like the Devil? 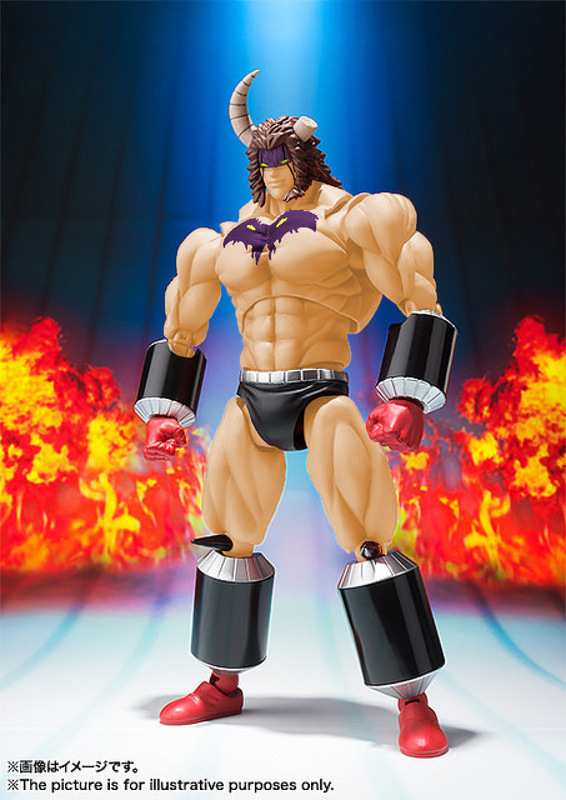 In my previous post, I said that naming the official figure "10 Million Powers Buffaloman" was misleading because it creates this conundrum, where now they can't release something like the moc-up below and call it "10 Million Powers Buffaloman," despite being a more universal representation of 10 Million Powers, and a much more versatile Buffaloman figure. Some might say what we're getting is the best of both worlds. 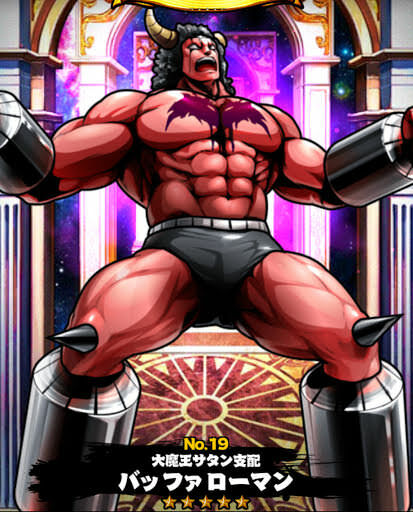 I suppose "10 Million powers" is a better name than "Satan Possessed", and the Satan chest maybe isn't cool enough on its own to sell. I think the red skin is cool enough though, and I wish they had just done that instead. I also wish they had given us the possessed face, since that's also a key feature to the possessed appearance. 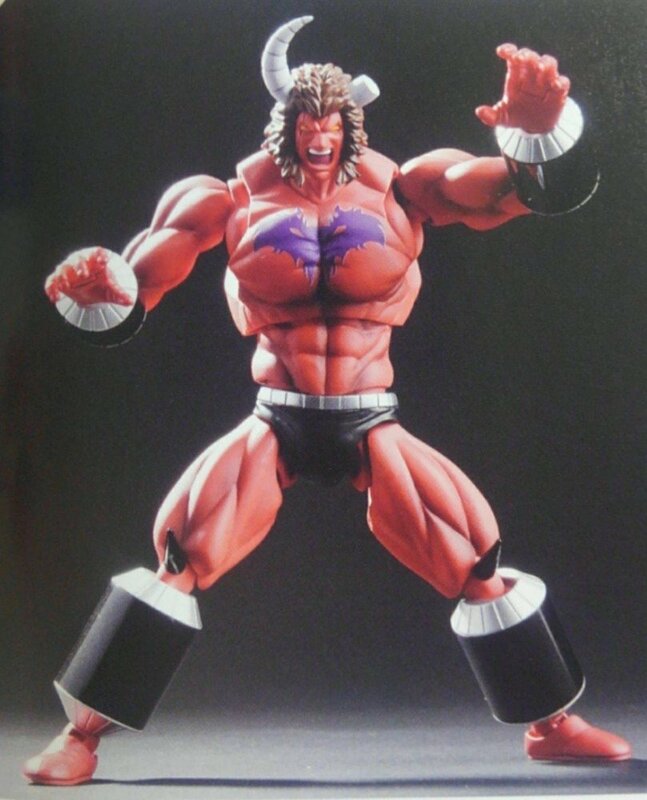 Medicos gave us one, and it would better distinguish this release from the previous Buffaloman figure. Edited by toyhandle, 25 April 2018 - 09:03 PM.